Color. Technology. Trust. Its a bond unmatched by any other brand. Here are some testimonials of chemistry between our product and our customers success. David Eckert of Eckert’s Rod & Custom has been in the field of custom restoration for about 30 years, including the past nine years with Eckert’s Rod & Custom. Located in Molalla, Oregon, Eckert’s Rod & Custom does custom restorations across the board including concourse and full custom restorations and concept cars. 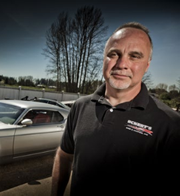 Eckert’s Rod & Custom made the switch to Valspar Automotive products, both DeBeer and Valspar Refinish, and has been happy with the results ever since. During SEMA 2012, Eckert’s Ford Mach 40 Mustang, painted in Valspar Automotive’s DeBeer 500 Series, walked away with three awards, including the Mothers Shine Award, “Best Hot Rod” and the Gran Turismo “Best in Show” Award, earning a spot in future Gran Turismo video games. “I like how easy it is to use and apply for one, it’s pretty forgiving as far as temperature and climate go. The other thing about it is the cost; it is not the most expensive and it’s not the least expensive. It’s really on the high end for the price that you’re paying. I like the repairability of it and how easy it is to use. The clears are awesome, because the clear is truly crystal clear, which is very important in our line of work as we basically abuse the products. We have been able to do that with Valspar’s products and not really have any problems whatsoever, so that makes it very nice. Sometimes you’ll have a little wave in the panel and we can actually come along and dump more clear on it to get the car perfectly straight. "I like how easy it is to use"